Equipment operators in a rural Alabama county are using a new wheeled excavator to turn difficult road work into a cakewalk, and residents are actually thanking them with sweet treats. Looking at a map, you can find Covington County, Ala., sitting atop the western end of the Florida Panhandle. Covington’s citizens get the joys of living a short drive from the beaches lining the Gulf of Mexico, but that also means they get the wet, hot weather the region is known for. Those warm, daily rains create a perfect environment for intrusive vegetation. Weeds, bushes and trees grow into ditches, rights of way, and often into the roadway themselves, creating safety risks by reducing adequate travel paths and blocking drivers from seeing other cars along the road. That’s why in 2018 Covington County designated a few staff members to work on clearing away the weeds and brush full time, and why they now use a wheeled excavator for the job. County officials are tasked with clearing vegetation from 1,290 miles of road. Consider the plants grow on both sides, which means the amount of roadway to be cleared is doubled. That’s more than 2,580 miles — a smidge below the 2,800 miles it takes to drive from Washington, D.C., to San Francisco. In the past, county employees would take tractors with a side boom mower attached to tackle the brush. The clearing process was tedious; the equipment longevity would not take the abuse over time and with breakdowns became cost prohibitive. Ralls is always looking for efficiencies. Having a rural community of 38,000 residents means county financing is usually pretty tight. He decided to invest in bigger equipment to make the process more efficient and turned to Sourcewell to find the best excavator for the county, eventually purchasing a Volvo EW180E. Covington County, Ala., workers are now clearing four to five weeks’ worth of road brush in two days, which is making happier residents. Ralls finalized his decision after local equipment dealer John Edwards from Cowin Equipment had him visit Santa Rosa County in nearby Florida to see the wheeled excavator. “We went and looked at the machine. We basically made our decision off that,” said Ralls. Cantaline and his crew attach a Pro Mac cutter to the end of the double boom to take down everything from high grass to splicing whole trees. They feel safer using these machines and enjoy the ease of driving a wheeled excavator to a site instead of hauling a crawler and risking any damage to the road with the tracks. 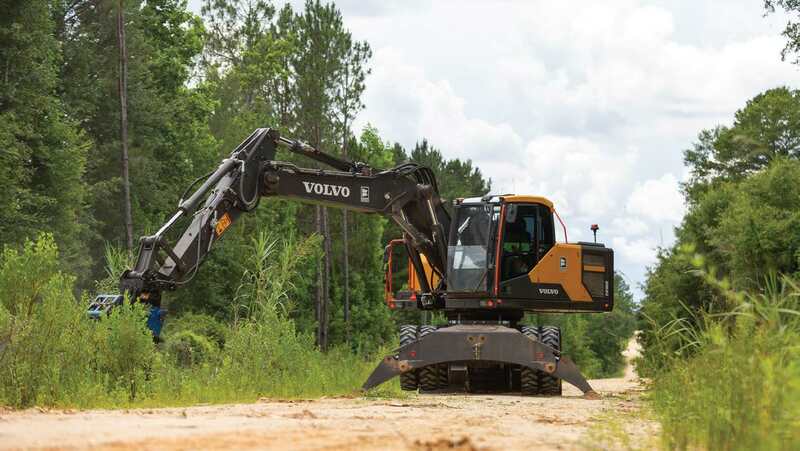 By using Sourcewell’s Volvo dealer cooperative contact, county leaders capture time/money savings, while choosing the right equipment for the job. People are so happy to have their dirt and paved roads cleared of the aggressive brush and trees that they bring the operators gifts. Sourcewell — formerly National Joint Powers Alliance — is a self-supporting government organization, partnering with education, government and nonprofits to boost student and community success. Created in 1978 as one of Minnesota’s nine service cooperatives, it offers training and shared services to its central Minnesota members. Throughout North America, it offers a cooperative purchasing program with over 300 awarded vendors on contract. Sourcewell is driven by service and the ability to strategically reinvest in member communities.